Angel Falls from Isla Raton. Angel Falls (indigenous name: Parakupa-vena or Kerepakupai merú which means the fall from the highest point, in Pemon language; Spanish: Salto Ángel) is the world's highest waterfall, with a height of 979m (3,212ft) and a clear drop of 807m (2,647ft). It is located in the Canaima National Park (Spanish: Parque Nacional Canaima), in the Gran Sabana region of Bolivar State, Venezuela. The height of the falls is so great that before getting anywhere near the ground, the water is atomised by the strong winds and turned into mist. The mist can be felt a mile away. The base of the falls feeds into the Kerep River (alternately known as the Rio Gauya) which flows into the Churun River, a tributary of the Carrao River. In the indigenous Pemon language Angel Falls is called Kerepakupai merú meaning "waterfall of the deepest place". The falls are sometimes referred to as Churun-meru, an error, since that name corresponds to another waterfall in the Canaima National Park. Churun in the Pemon language means "thunder". 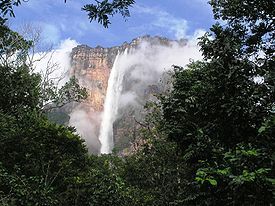 Sir Walter Raleigh described what was possibly a tepuy (table top mountain), and he is sometimes said to have discovered Angel Falls, but these claims are considered "far-fetched". They were spotted in 1912 by the Venezuelan explorer Ernesto Sanchez La Cruz, but he did not publicize his discovery. They were not known to the outside world until American aviator Jimmie Angel flew over them on 16 November 1933 on a flight while he was searching for a valuable ore bed. Returning on October 9 1937, Angel tried to land his Flamingo monoplane "El Rio Caroni" atop Auyan-tepui, but the plane was damaged when the wheels sunk into the marshy ground, and he and his three companions, including his wife Marie, were forced to descend the tepui on foot. It took them 11 days to make their way back to civilization, but news of their adventure spread, and the waterfall was named "Angel Falls" in his honour. Angel's plane remained on top of the tepuy for 33 years before being lifted out by helicopter. 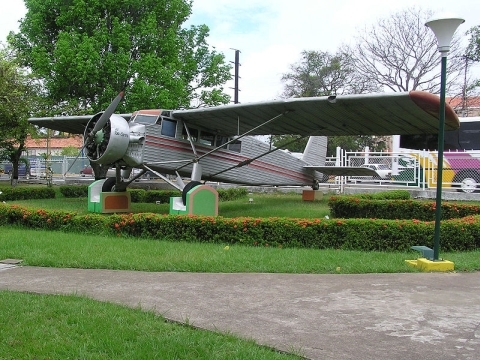 It was restored at the Aviation Museum in Maracay and now sits outdoors on the front of the airport at Ciudad Bolivar. The first recorded person to reach the river that feeds the falls was Latvian explorer Aleksandrs Laime, also known as Alejandro Laime to the native Pemon tribe. He made the ascent of Auyan-tepui in 1955. He also reached Angel's plane on the same trip, 18 years after the crash landing. He gave the river feeding the falls the name Gauja after a river in Latvia, but the Pemon-given name of the river, Kerep, is still widely used. Laime also was the first to clear a trail that leads from the Churun river to the base of the falls. On the way, there is a viewpoint commonly used to capture the falls in photographs. It is named "Mirador Laime" ("Laime's Viewpoint" in Spanish) in his honour. This trail is used now mostly for tourists, to lead them from the Isla Raton camp to the small clearing. The official height of the falls was determined by a National Geographic Society survey carried out by American journalist Ruth Robertson in 1949. A book by Luke Dickinson, Angels Four, chronicles the first successful climb up the face of Auyantepui to the top of the falls. Angel Falls is one of Venezuela's top tourist attractions, but even today a trip to the falls is not a simple affair. The falls are located in an isolated jungle region of Venezuela, and a flight from Caracas or Ciudad Bolívar is required to reach Canaima camp, the starting point for river trips to the base of the falls. It is also possible to purchase a package that includes an aerial flyby of the falls. The falls cannot be seen on cloudy days, and there is no guarantee visitors will see them. River trips generally take place from June to December, when the rivers are deep enough for the wooden curiaras used by the Pemon Indian guides. During the dry season (December to March) there is less water than is seen in some photos, but it is also more likely that the top will not be clouded.